Georgian writer, essayist, translator from the Japanese language (he has given up this latter occupation, as he says, “discouraged by the prospect of doing the same thing for 30 years”). He was born in 1956 to an artillery officer and a teacher of Russian. Akunin is actually a pen name and it does not allude only to Mikhail Bakunin, a Russian revolutionary anarchist, but also to the Japanese word “akunin” meaning a “villain”, which in a certain way characterizes Akunin’s books and their tendency to play with conventions, genres, plots and history. 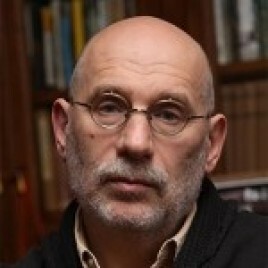 Boris Akunin is the author of a few big novel series (including the unfinished Erast Fandorin series, whose main character had been “chemically” made up as the mixture of specific ingredients: [Lermontov’s] Pechorin, Sherlock Holmes and James Bond; or the Genres Project: pastiches of all possible literary genres). Within the period of 15 years he wrote about 50 novels. As he says, he simply walks Moscow boulevards and ideas get into his head by themselves, he only has to stop every now and then and take notes. He describes himself as being a literary project exclusively, he enjoys not only writing but making fun of his own image as well. Next to Victor Pelevin, Vladimir Sorokin and Mikhail Shishkin, he is one of the most eminent Russian prose writers. He has sold around 30 million copies of his books in Russia and abroad.